A which were free from the controls that existed in European societies. They wanted to escape the controls placed on many aspects of their lives by kings and governments, priests and churches, noblemen and aristocrats.1 To a great extent, they succeeded. In 1776, the British colonial settlers declared their independence from England and established a new nation, the United States of America. In so doing, they defied  the king of England and declared that the power to govern would lie in the hands of the people. They were now free from the power of the kings. In 1789, when they wrote the Constitution for their new nation, they separated church and state so that there would never be a government-supported church. This greatly limited the power of the church. Also, in writing the Constitution they expressly forbade titles of nobility to ensure that an aristocratic society would not develop. There would be no ruling class of noblemen in the new nation. 7 The historic decisions made by those first settlers have had a profound effect on the shaping of the American character. By limiting the power of the government and the churches and eliminating a formal aristocracy, the early settlers created a climate of freedom where the emphasis was on the individual. The United States came to be associated in their minds with the concept of individual freedom. This is probably the most basic of all the American values. Scholars and outside observers often call this value individualism, but many Americans use the word freedom. It is one of the most respected and popular words in the United States today. 8 By freedom, Americans mean the desire and the right of all individuals to control their own destiny without outside interference from the government, a ruling noble class, the church, or any other organized authority. The desire to be free of controls was a basic value of the new nation in 1776, and it has continued to attract immigrants to this country. They owe nothing to any man, they expect nothing from any man; they acquire the habit of always considering themselves as standing alone, and they are apt to imagine that their whole destiny is in their own hands. 10 This strong belief in self-reliance continues today as a traditional basic American value. It is perhaps one of the most difficult aspects of the American character to understand, but it is profoundly important. Most Americans believe that they must be self-reliant in order to keep their freedom. If they rely too much on the support of their families or the government or any organization, they may lose some of their freedom to do what they want. 11 Often adult children return home to live with their parents because of economic conditions or a failed marriage. Parents are usually happy to help out, but most members of the family expect this to be a short-term arrangement. When people are dependent, they risk losing freedom and they may also lose the respect of their peers. Even if they are not truly self-reliant, most Americans believe they must at least appear to be so. In order to be in the mainstream of American life—to have power and/or respect—individuals must be seen as self-reliant. 12 Although Americans provide a lot of financial support to people in need through charities or government programs, they expect that help to be short-lived. Eventually, people should take care of themselves. Although receiving financial support from charity, family, or the government is allowed, it is generally not admired. Some people believe that such individuals are setting a bad example, which may weaken the American character as a whole. The sight of beggars on city streets and the plight of the homeless may inspire sympathy but also concern, for the same reason. Or the Decline of American Abundance? that there might be a limit to their abundant natural resources and the lifestyle that these natural resources had supported. The 1980s and 1990s brought a general turn­around in the economy, but it was often the rich who got richer and the poor who got poorer. The dramatic fall of the stock market in the early 2000s cost many middle-class Americans much of their retirement savings, forcing them to work longer. The response of most Americans to economic downturns is generally to work harder, and their productivity has risen significantly as a result. and to send the children to college. But the cost of all these things has been rising, while the number of high-paying jobs in factories has been declining. Those without a college education are hardest hit. The new jobs are often in the service economy— in stores, restaurants, or hotels—not in the manufacturing economy in factories. Many of the service workers, such as janitors and dishwashers, have relatively low pay and poor benefits. As a result, many Americans must work harder than their parents did to have the same standard of living. Often, young parents believe that it is necessary for both of them to work outside the home in order to maintain their lifestyle. The average number of hours per week that Americans work has risen to well over forty hours, with many professionals (teachers, doctors, lawyers, businesspeople, etc.) working fifty or sixty hours per week. 34 Although Americans are working harder and have less leisure time, many are still having difficulty keeping up with rising costs, particularly for housing. Many people have to spend a larger percent of their income on owning a home or renting an apartment. Today, many families cannot afford to buy a house in the area in which they are living, and so they live in apartments. In some areas, even apartments are too expensive for some full-time minimum-wage-earners to rent unless they are subsidized by government funds. Minority populations are often the hardest hit, especially those with entry-level jobs such as janitors, hotel maids, fast-food cooks, and agricultural workers. 15 Д Д oney is also increasingly a factor in a college education. All university students i_VA must pay tuition expenses in the United States, and the cost of an education is rising much more rapidly than is the average family income (about five times higher between 1991 and 2001). Because tuition is much lower at public universities than at private ones, wealthy students have more choices. There are a number of financial aid programs in the form of loans and scholarships available at both public and private schools. However, the expenses of buying books and living away from home make it increasingly difficult for many students to attend even the less expensive public universities. Many students must work during their college years to help meet costs. they are low-paying jobs in the service sector of the economy—such as in fast-food restaurants, small stores, and hotels. Additionally, many jobs are being outsourced to countries where salaries are much lower. This is true of both higher-paying technical jobs and lower-paying jobs requiring limited skills. 21 Because of the importance of higher education, many adults combine working with taking classes at a college. Many public and private colleges and universities are making it easier for students to take classes through distance learning, using the Internet to provide materials and lectures as well as to engage students in discussion. Some students who are living on campus or commuting to classes take at least part of their coursework by distance, but it is also possible for a student to obtain both undergraduate and graduate degrees without ever being on a college campus. 22 A merican schools tend to put more emphasis on developing critical-thinking JLjL skills than they do on acquiring quantities of facts. American students are encouraged to ask questions, think for themselves, and express their own opinions in class, a reflection of the American values of individual freedom and self-reliance. The goal of the American education system is to teach children how to learn and to help them reach their maximum potential. 23 The development of social and interpersonal skills may be considered as important as the development of intellectual skills. To help students develop these other important skills, schools have added a large number of extracurricular activities (activities outside classroom studies) to daily life at school. These activities are almost as important as the students’ class work. For example, in making their decisions about which students to admit, colleges look for students who are “well – rounded.” Grades in high school courses and scores on tests like the SAT are very important, but so are the students’ extracurricular activities. It is by participating in these activities that students demonstrate their special talents, their level of maturity and responsibility, their leadership qualities, and their ability to get along with others. 24 Some Americans consider athletics, frequently called competitive sports, the most important of all extracurricular activities. This is because many people believe it is important for all young people, young men and young women, to learn how to compete successfully. Team sports such as football, basketball, and baseball are important because they teach students the “winning spirit.” At times, this athletic competition may be carried to such an extreme that some students and their parents may place more importance on the high school’s sports program than its academic offerings. 25 Student government is another extracurricular activity designed to develop competitive, political, and social skills in students. The students choose a number of student government officers who compete for the votes of their fellow students in school elections. 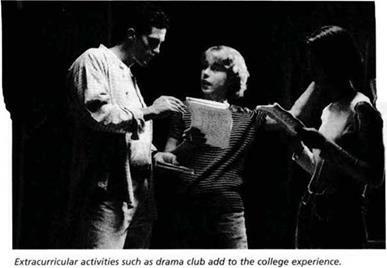 Although these officers have little power over the central decisions of the school, the process of running for office and then taking responsibility for a number of student activities if elected is seen as good experience in developing their leadership and competitive skills, and in helping them to be responsible citizens. volunteer work—all aimed at helping the student to become more successful in later life. Many parents watch their childrens extracurricular activities with as much interest and concern as they do their children’s intellectual achievements in the classroom. So in this continent, the energy of Irish, Germans, Swedes, Poles and all the European tribes, of the Africans, and of the Polynesians—will construct a new race, a new religion, a new state. 8. If an ethnic minority wants to retain its culture, are families more likely to continue speaking their native language at home or to speak English? 9. If smoking is prohibited in a public facility, are you allowed to smoke there or not? 10. How many generations back can you trace your ancestry? B. Some words in English have a positive or negative connotation. That is, they give you a good or bad feeling. For example, hero has a positive connotation, while villain has a negative connotation. Write a plus sign (+) next to the words that you think have a positive connotation and a minus sign (-) next to words with a negative connotation. В. Before you read the chapter, read the headings for each section. Which sections do you think will help you answer these questions? Write the heading of each section in the space below each question. 1. When did slavery end in the United States? 2. When did legal segregation end? 3. Why do some people describe American culture as a “salad bowl”? 4. How will diverse cultures affect the nation in the future? 5. What group had the strongest influence on the American culture? 6. What effect did immigrants from southern and eastern Europe have on the American culture? 7. What contradictions are there in American society today? 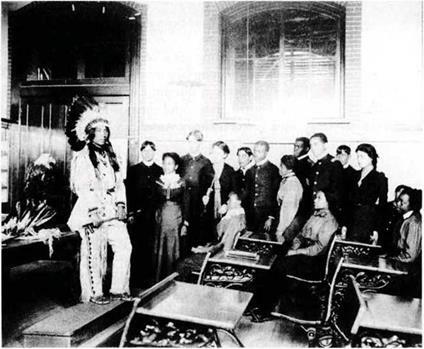 In 1899, an American Indian speaks to a history class at Hampton Institute, Virginia, a historically black college. X hard work and self-discipline. It also includes the idea of improving oneself by helping others. Individuals, in other words, make themselves into better persons by contributing some of their time or money to charitable, educational, or religious causes that are designed to help others. The philosophy is sometimes called volunteerism or humanitarianism. or humanitarian causes in order to be acceptable in the eyes of God and in the eyes of other Americans. Many businesses encourage their employees to do volunteer work, and individuals may get tax deductions for money given to charity.